What are Volatile Organic Compound Paints? Volatile organic compounds (VOC) are one of the key components of oil-based paints. They are also found in some traditional latex-based paints. These compounds are known to trigger asthma attacks and cause eye and throat irritation. In extreme conditions, VOCs can cause nausea and dizziness. These are even linked to kidney and liver problems and are carcinogenic. The solution to reduce these harmful VOC compounds is to use low-VOC paints. Volatile organic compounds are used to improve performance and durability of the paint or finish. Cleaning of paint brushes and other tools usually use toxic substances that release VOC pollutants when mixed with the paint. A solution to this provided by paint manufacturers is latex-based paints. These paints are more environment friendly, as they use water as the solvent and carrier. These paints are just as good or better than oil-based paints in terms of quality and durability. The application techniques for both VOC and non VOC paints are the same and will not prove to be an additional hassle. These paints can easily be cleaned as it takes only soap and water to clean all the painting implements. These paints can be classified into low odor or low-VOC paint, zero-VOC paint, and non-toxic or natural paint. VOC content in paints can be classified as per the concentration of these compounds in the paint. Paint is classified as minimal if the VOC content is between 0 to 0.29%. Paint is said to have low-VOC content when the amount of compound is 0.3% to 7.99%. A medium VOC content paint ranges from 8% to 24.99%. Paints that have a high VOC content are measured to have contents ranging from 25% to 50% and a very high VOC content is one where the content is more than 50%. Another solution to VOC paints is ceramic wall paints. These paints have a ceramic coat that has low levels of VOC. The painted walls can easily be scrubbed clean without any loss of finish and can even be treated to prevent growth of mildew and bacteria. 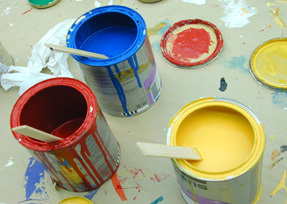 The use of low-VOC paints is especially popular in buildings where air pollution needs to be restricted. Some good examples of this are hospitals and schools. This is the ideal choice for people who are suffering from respiratory problems.